Pat: I am the light, love and laughter of the office — I like to make everyone feel comfortable! My job is not a glamorous position, but I hold it all together for everybody. I’m the go-to person; I take care of what people need at personal and professional levels. I handle all emails and phone calls that come in, forwarding them to the proper people and making sure that we respond to urgent matters immediately. I check what’s going on in terms of office supplies, set up catering for sales events and meetings, and pick out the appropriate flowers and gifts for special occasions. Question: From where did you get your degree/receive your training in finance/factoring? Pat: I received a lot of on-the -job training. I actually started at a florist in Brooklyn, and I got a lot of my training there. I went back to school as well; I now have my degree in business management. Question: When did you first decide you wanted to be in this field/industry? Pat: To be honest with you, when I moved to Long Island, I was commuting to and working in New York City. The commute to the city was wearing me out. I decided to look for something more local. When I met with Jim DiCamillo and Donald Barrick,, we realized there was a common need on the spot. What RMP Capital was looking for and what I was looking for — everything fell into place. Pat: I knew I loved getting involved with volleyball and sports, but what I really was interested in was religious education. I fell into that whole dynamic of a belief system. Pat: It will be five years in May 2016. Pat: I think the thing is that Donald and Jim really try to make it feel like a family. They’re very understanding, and that really helps me feel like this is a nice place. It’s not an uptight office, and everyone kind of goes with the flow. It’s a good feeling. Pat: I love playing hide and seek with my 2-year-old grandson, because he laughs from the belly. It’s just an amazing experience. I love spending time with my daughter and son-in-law. I do a lot of volunteer work: I teach religious education, and in the past I’ve done toy drives, food drives and other charitable events and initiatives. I work out and do yoga as well. 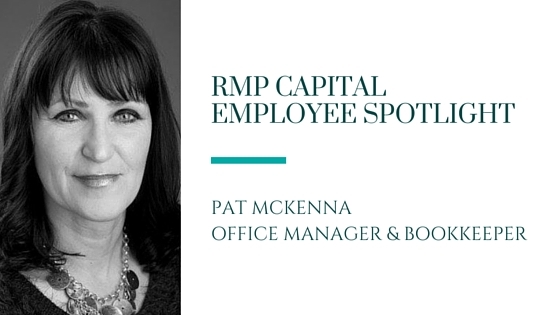 Pat, we’re so grateful for your contributions to RMP Capital. Thanks for allowing us to get to know you a little better!